Because Ken wanted to do some walks to fill in his 'life programme' that did not avail themselves well to the use of public transport, he took the truck & thus, he also took Avis, so why not have a stay in Stresa & a visit to Ken's cousin Liz, who lives in Milan, while we were at it? The Italian Holiday part went well but there were problems with the hilly part. We set off for Dover at 0445 for the 0735 ferry to Calais & then, by the French & Belgian motorways to Luxembourg & on to Nancy. 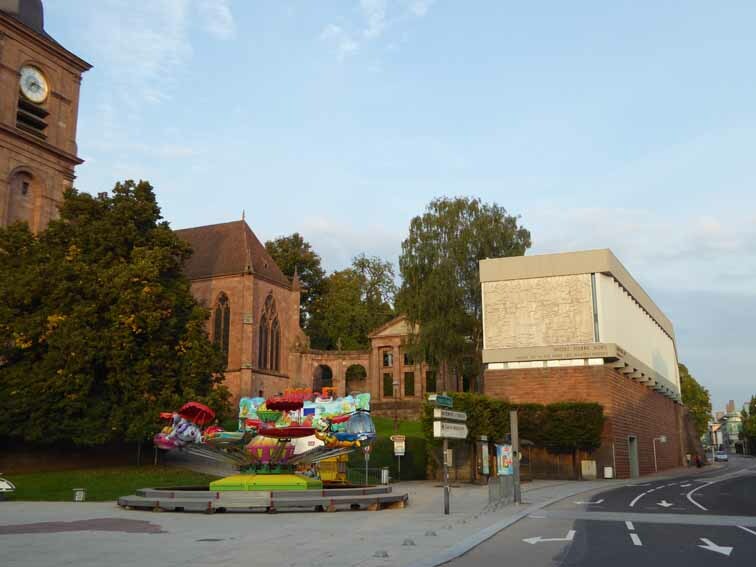 The hotel we thought to use had disappeared (! 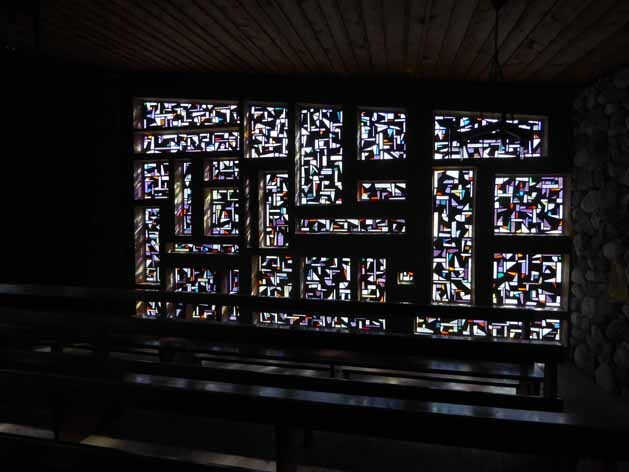 ), so we went on to St. Dié under the Vosges, which turned out to have been a good idea. 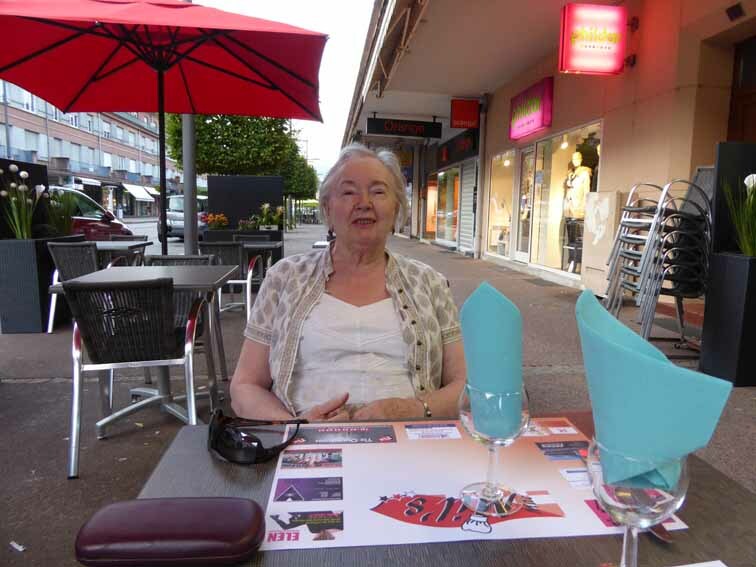 We booked in overnight at the Hotel Ibis & had an excellent dinner in the curiously named but very French, MacMils Restaurant (Rue Thiers) during a walk round the town. 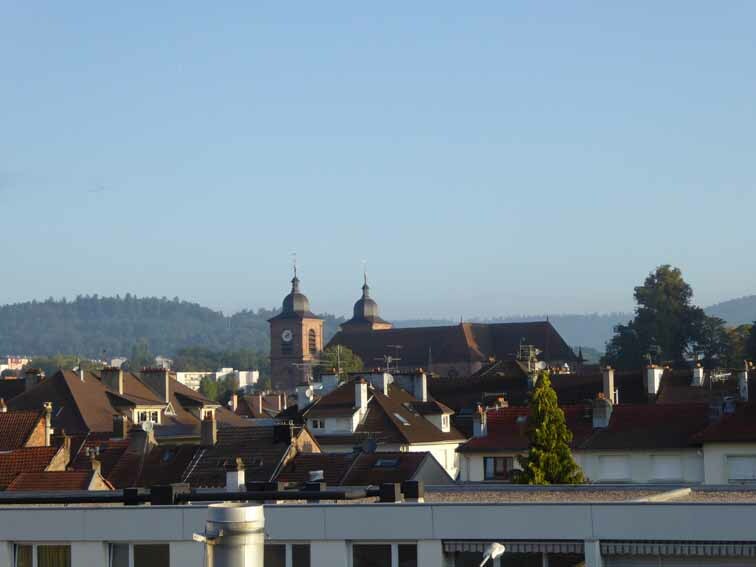 The next day, after filling up with the remarkably cheap diesel at €1.28, we went over the Vosges to Colmar & South through Basel & along the Swiss motorways to Lungern (our 'Xmas Card' photo), having bought a vignette (Swiss motorway sticker) for £32.50 this time. 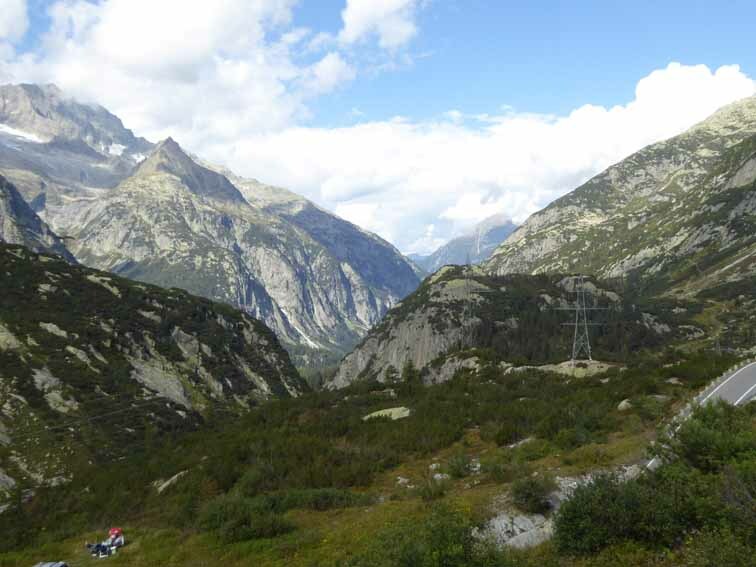 From Lungern & over the Bruenig Pass, we went to Innertkirchen & up the Grimsel Pass to our next night stop. 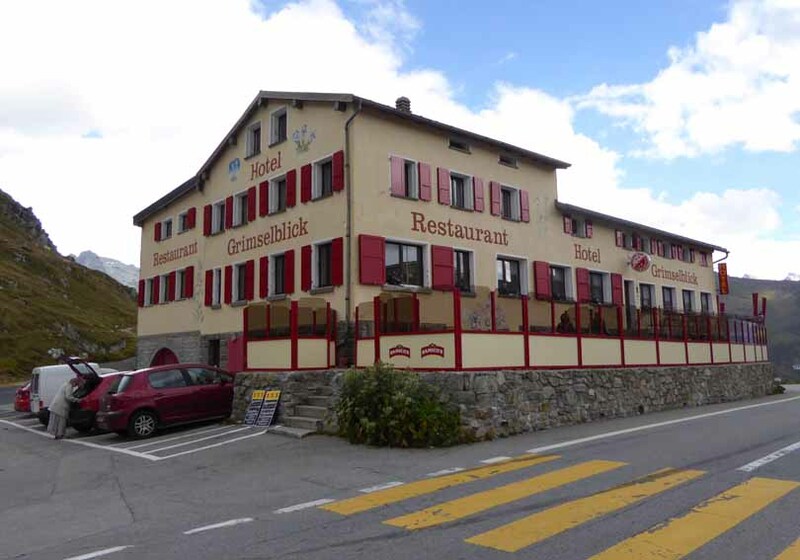 The old Grimsel Passhoehe Inn has been closed for 4 years, we discovered, so we stayed in the Hotel Grimselblick, on this link in German, much posher & folklorische. 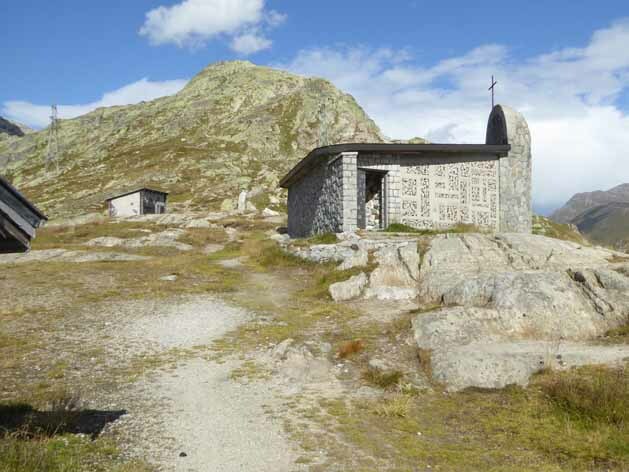 After a late lunch (giant salad & Kaeseschnitte with eveything in it) we went for a walk to see the chapel & the Furka Pass. 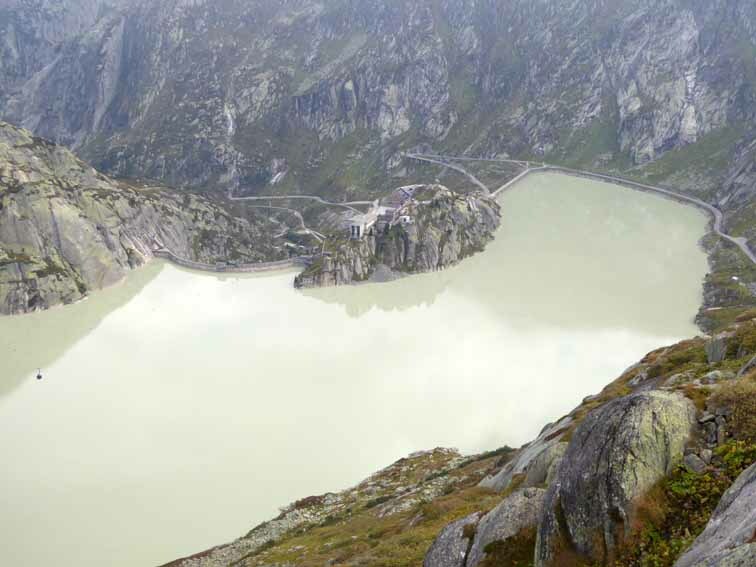 Next day, Ken walked above the Grimselsee to the Triebtenseelwi above its end & back. 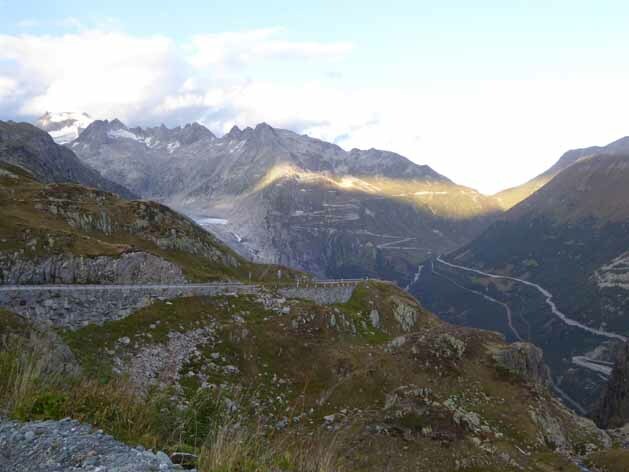 There being plenty of day left, we drove back to Innertkirchen & round the other two passes of the Three Passes Tour but the weather had decided to crack down. 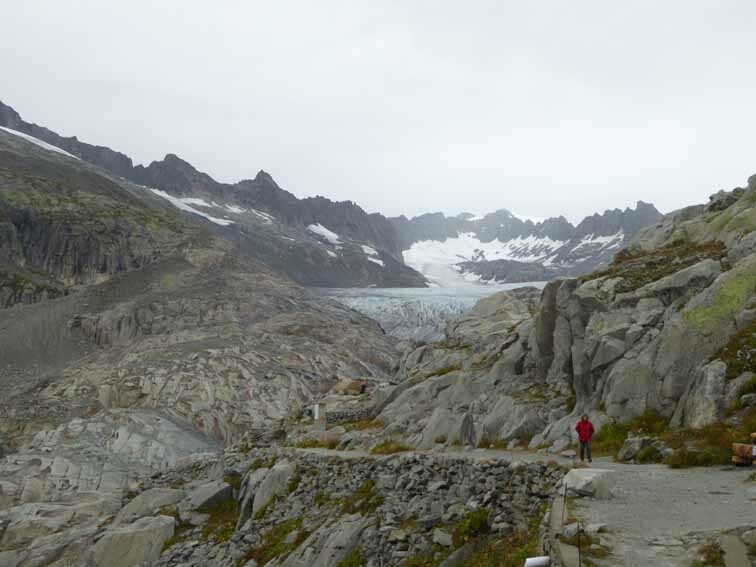 It did stop raining for us to stop at the Belvedere for a snack by the Rhone Glacier, now much shrunken from when Ken first saw it in 1957. 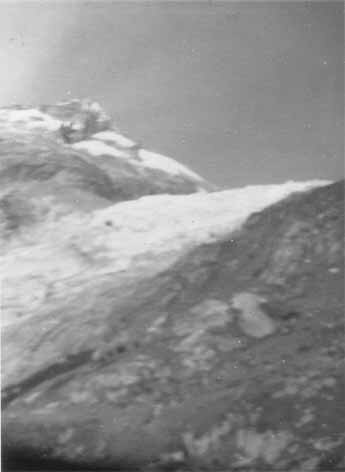 (The top of the left-hand photo below is roughly at path level in the right-hand photo). 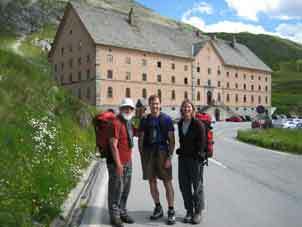 We carried on down the Gomsertal (Rhone valley) to Brig & up the Simplon Pass to the Hospiz (Monastery) Ken has stayed at before. The Hopiz is going soft. 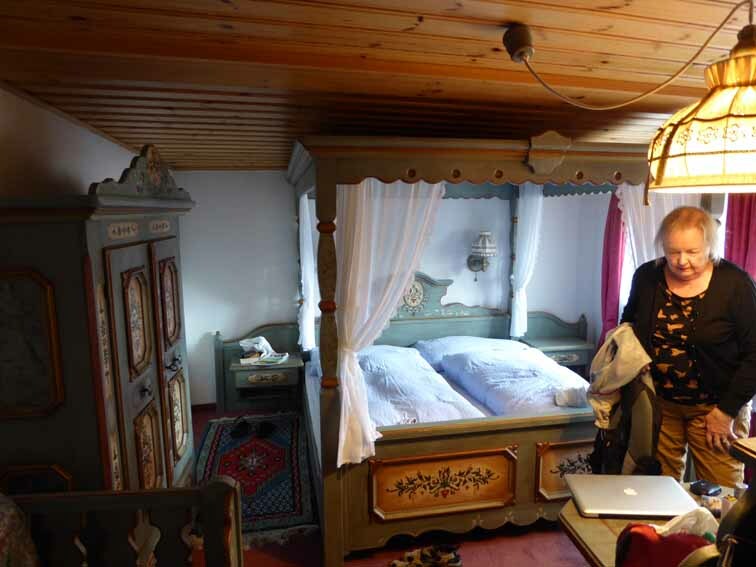 We had a twin room with its own bathroom! Fortunately, dinner was as usual, basic but very adequate & the company was interesting, especially a Swiss shyster lawyer involved in tax dodges & the Esterhazy Estate, who was nervous about what we mght say to his son. 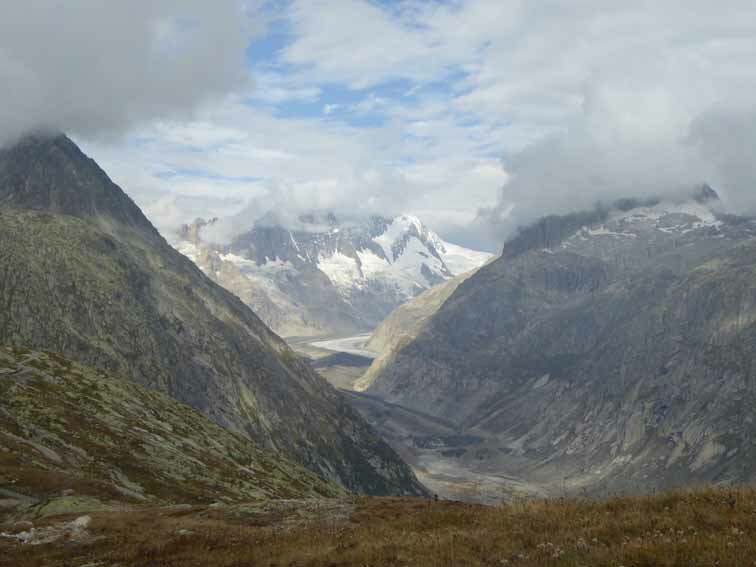 The next day, Ken walked down the South packhorse track of the Simplon Pass on this link. 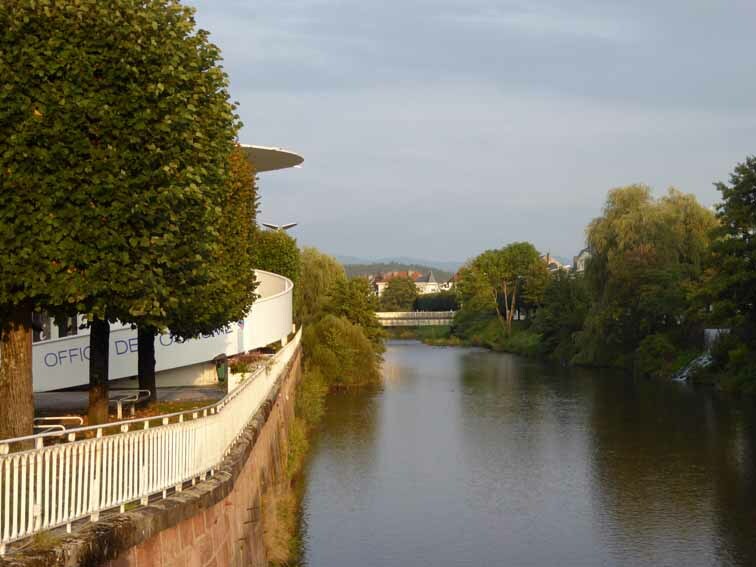 Avis drove down & passed him on the only 150 metre stretch where the road & track coincide! We met up at the garage in Gondo, the last village before the Italian frontier, where we had lunch. The next bit did not go to plan. 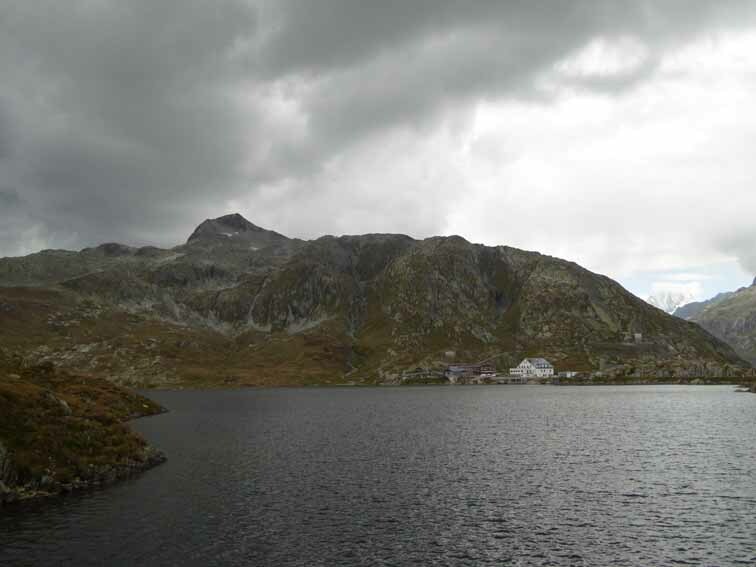 We drove down the valley & up the Macugnaga Valley to Staffa. The Tourist Office was closed, although hotels were open but Ken did not trust a hotel to give him reliable information about the Monte Moro track, so we scratched that & went down, with some geographical difficulty, to Stresa on Lago Maggiore. After a diligent search, we booked into the only hotel with both a room & parking, the Hotel Royal & us, dedicated republicans. Now, go to the Next Page for pictures & stuff about Stresa. This page's URL: http://www.art-science.com/Xmas2014/travel2.html Last revised 1/12/2014 Copyright: ©Ken Baldry 2014 All rights reserved but print it off if you want to.